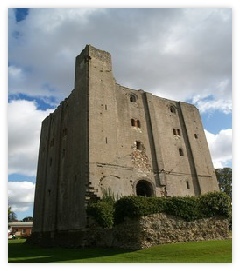 Castle Hedingham lies on the northern slope of the valley of the River Colne. The town is sited on glacial gravels and clays,with marshland to the west between the castle and the river. Evidence of settlement here pre-dates the Roman occupation and there was a Saxon community of some size by the end of the 9th century. However, Castle Hedingham’s development and significance is primarily due to the Normans. Land in Hedingham was granted to Aubrey deVere in 1066 and he erected a ringwork shortly afterwards. By 1086, the village is recorded in the Domesday Book as Haingham (the ham of Hedin’s people). It was sizeable community and grew from 64 households in 1066 to 87 by 1086. In 1142 Aubrey deVere III was made Earl of Oxford by the Empress Matilda and his building of a stone castle keep within the ringwork marked this event. Shortly after the keep completion, the deVeres founded a Benedictine nunnery on the banks of the Colne. 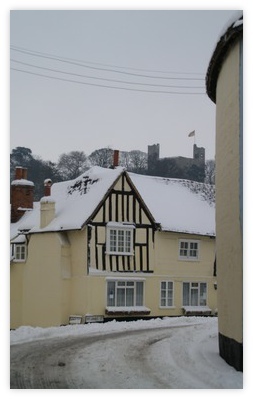 The castle saw military action in 1215-16 as Robert deVere, 3rd Earl of Oxford, was one of the Magna Carta barons who forced the sealing of the Magna Carta on King John, who months later came to Hedingham and re-possessed the castle from a now compliant Robert. By 1216, Castle Hedingham market was in existence and the church of St Nicholas had been built, the present chancel, nave, north and south aisles all dating from c.1180. The following century saw the building of a hospital at ‘the gates of the castle’ with its own chapel. The 1592 map by Armyse shows a field labelled ‘Cappell yard’( where the parish playing field is now) which is thought to be a reference to the hospital and chapel having once stood there. The important medieval Hedingham pottery industry was also founded by the deVeres at this time. There appears to be little development in post medieval Castle Hedingham. The 1592 map shows a medieval village lying below the castle, roughly hemispherical in plan with the outer castle bailey forming the limit of the town on one side and the town defensive ditch on the other side. In the centre is the church with the triangular market-place of Falcon Square immediately to the east of it. The significant development in post medieval Castle Hedingham was caused by the Reformation with the loss and dissolution of both the hospital and the nunnery. Henry VII visited at the end of the 15th century and levied a fine of 15,000 marks on the 13th Earl of Oxford for assembling too many retainers; and Elizabeth I visited in 1561 when she was royally entertained by the 17th Earl, who some claimed to be the real William Shakespeare. The deVere ownership of the castle estate passed through marriage to the Trentham family and was sold to the Ashursts in 1713. Through marriage, ownership passed to the Majendie family in the 19th and 20th centuries. Castle Hedingham has many associations with noted figures in history. The artist Eric Ravilious lived here in the1930s; Mark Catesby was born here in 1683 and went on to record the Natural History of Florida and South Carolina; deVere Stackpole wrote the Blue Lagoon whilst living in the village; Thomas Fowell Buxton the significant anti- slavery reformer in the early 19th century lived here, as did Edward Bingham, the gifted potter who produced his famous Hedingham ware in the late 19th century.